In KegMetrics we provide multiple users. Generally speaking, we don’t charge extra per seat like many other software solutions might do. I mean what’s the point? You run a business and have multiple people in it. You need to improve communication and your software should not charge you extra to do so. There are three levels of user permission in KegMetrics. They are: Owner, Manager, and Staff. Owner: There is only one owner of the KegMetrics account. This person is cc’d on Notification Emails automatically and all customer emails that are sent use the email address associated with this person. 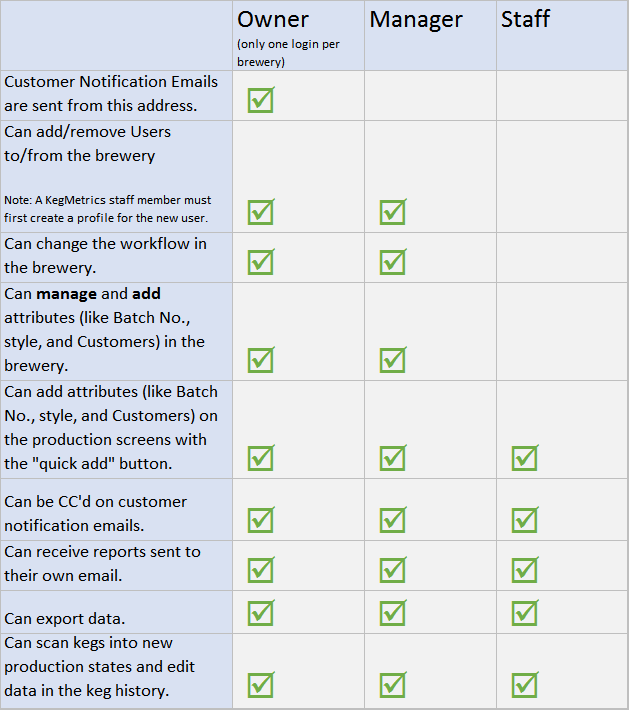 Manager: There can be multiple managers in a KegMetrics account and they can add and remove users, configure the brewery and do everything a staff person can do. Staff: There can be multiple staff users of a KegMetrics account. They can log into KegMetrics and use the application including updating status on Kegs. When you have multiple users in your KegMetrics Account each user has their own login and when they update the status of a keg, that information is tracked in the keg history, so you can always see who has changed what.